Lovely renovated farmhouse, attached with the house of the owners on 65m. The charm of the antique is promoted by the comfort of the modern. We give priority to quietness in a very green and wooded countryside, on the edge of the river. The design is really luxurious. The pool is covered and heated which permits to swim all year long. If the season allows it, you will pick your vegetables in the garden. The house is lovely, charming and tidy. Helene and Albert were terrific host. We received fresh eggs, homemade brioche, jam and terrine and lots of warm smiles. My daughters enjoyed their 2 sweet dogs, the swing set and the free range chickens. 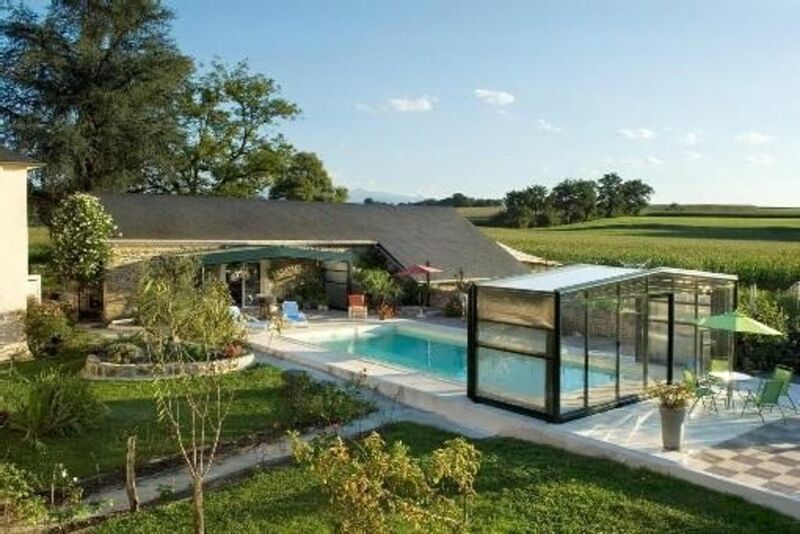 The location is perfect... serene and tranquil with a view of the Pyrenees. Thank you for your kind message and Happy New Year 2019 !!! A delightful VRBO, in rural France not far from the Pyrenees. The host was gracious and as helpful as she and her husband could be, given that I speak very little French and she, in contrast to what the listing says, spoke very little English. However, her home shares some of its space with a kind of travel agency, and there were always people around (during the day) who spoke enough English to solve any problems, eventually. That is the only even remotely negative thing that I can say, and it was not an issue for me during the stay. I am unlikely to get to this part of the world again any time soon, but I would definitely choose to stay here, especially if I were traveling with someone who wanted to share some quiet time away from the bigger cities. Lovely accomodation and wonderful area and scenery . The Pyrenees are breathtaking. Everything provided by the owners. Would recommend . A marvellous place to stay with our two children aged 10 and 13. The pool was the perfect temperature and the air conditioning a real treat in the very warm two weeks we had, as well as the wonderful fresh eggs. The area is beautiful, and with easy access to the Pyrenees it made every day an adventure. We particularly enjoyed walking around the cirque de Lescun, the train d'Artouste, lacs des Ayous, lac de Gaube and the Pont d'Espagne to name but a few. Very nice place although we didn't try the pool. unfortunately the second bedroom was a loft closed off by a light curtain with the bathroom down tight stairs. Our fellow travellers found the beds not very good but the owner arranged to move them to a nearby B&B at no charge. Gite and hosts wonderful. HomeAway admin appalling.